Not all run bikes are created equal. Most are created for the market and not for your child. 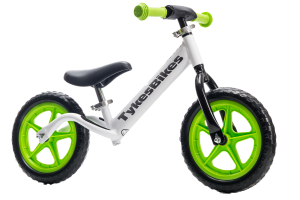 Tykes Bikes are designed for success with the toddler in mind. 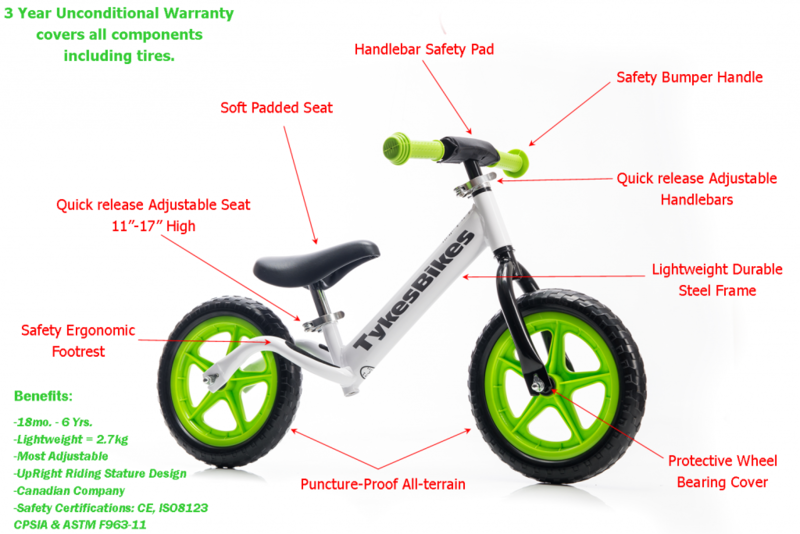 Years of research and development have gone into the design of our bikes. Competitive models are heavy and designed without the thought that your child needs to feel confident and in control. Our fully adjustable seat and handlebars create the perfect fit for your child. 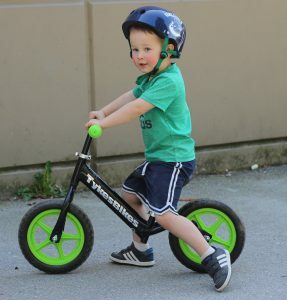 With a low seat and higher handlebar, your child begins their journey of learning balance in an upright standing position with their weight on their bottom. This creates an “I CAN” attitude in your child’s mind. 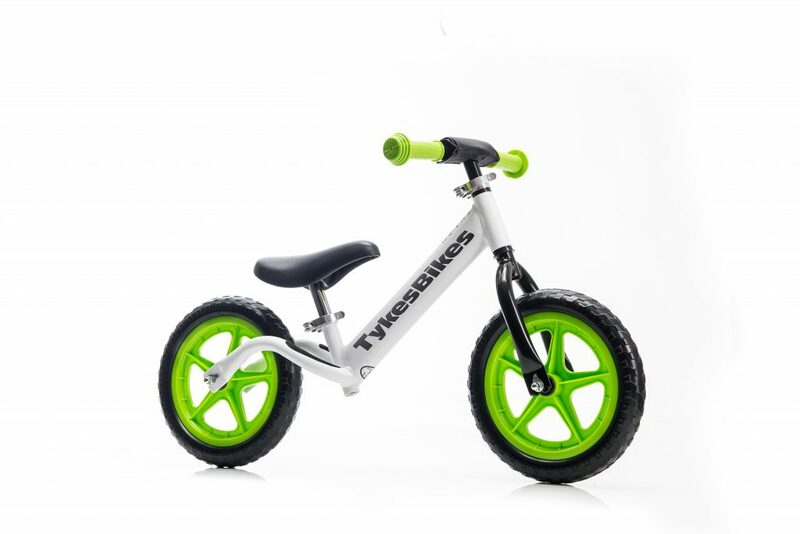 Our light weight, wide stance with big wheels allow your child to maneuver and control their bike with their eyes and upper body facing forward not down towards the ground. Do your research and your child a favour, as this is their first experience with balance. 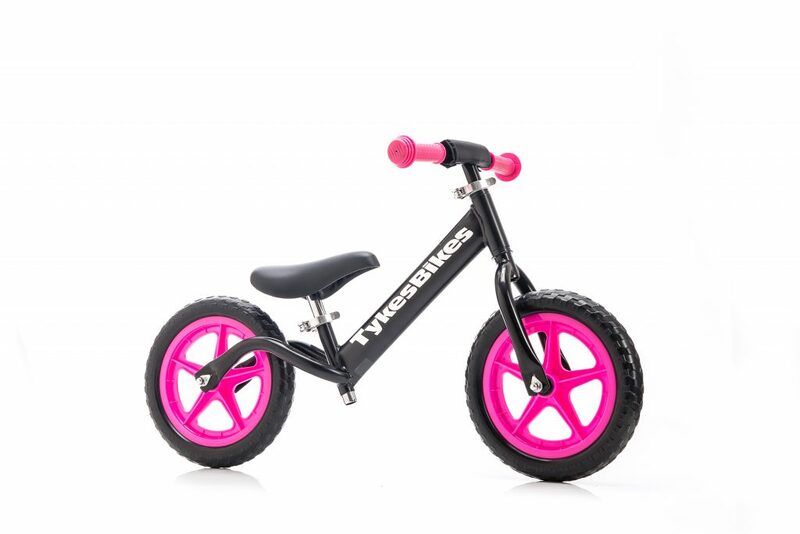 Don’t settle for just any bike, buy your child the best for success. Fully Adjustable Seat and Handlebars with a quick release on both. All terrain, very durable polymer solid tires. (Don’t be fooled by dealers who tell you they break, wear down or don’t grip). 11” tires to get them over bumps and obstacles with ease. Ergonomic foot rest for successful gliding. Seats lowest setting is 11″ from floor to seat. Family owned local Canadian company. 3 Year UNCONDITIONAL warranty. This includes the tires and even if anything damaged by accident. A price that no one with similar quality and design features can compete with. Fits ages 18 months to 5 years old. Pick up in Pitt Meadows. Visa, M/C, cash and etransfer. Call or text to pick up your bike today! We are always fully stocked!! Shipping options available through Canada Post and FedEx. 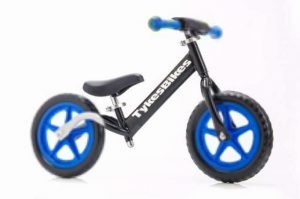 tykesbikes © Copyright 2017. All Rights Reserved.